Irkutsk's open-air museum of Taltsy Village, Siberia. Lake Baikal, the world's largest and oldest freshwater lake. High fashion isn't uncommon in Siberia. The golden-domed Church of Blood in Honour of All Saints Resplendent. 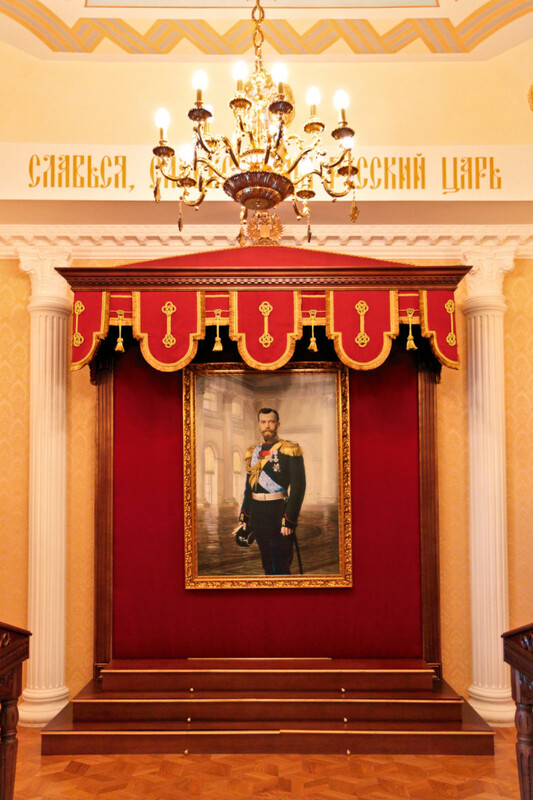 A portrait of Emperor Nicholas II in The Church of St. Nicholas. Eva Collins travels to Siberia, where her great-grandfather was sent to one of its infamous gulags, and finds a region and people (many shod in designer footwear) striving to distance themselves from the past. At the age of 66, I decided to go to Siberia – icy, windswept, isolated. It is the place where millions were sent and millions perished, condemned to brutal labour camps, or ‘gulags’, for a range of perceived crimes, some as tenuous as the mere suspicion of criticising the Tsar and later the Soviet leaders. My own great-grandfather was one of them, exiled there in the late 19th century for secretly teaching Polish children their history, while the Tsar was trying to Russify Poland. I wanted to go to see the region where my great-grandfather ended up, but also to find out what life is like for people there and how they feel about the brutal legacy of these camps, set up as a means of extreme punishment. Irkutsk, the capital of eastern Siberia, can be reached by taking the famed Trans-Siberian railway (north from Mongolia, east from Moscow and west from Vladivostok). The original line, begun in 1891 and finished in 1916, is the third-longest single continuous railroad in the world, linking Europe to Asia. At nearly 9300 kilometres, it spans seven time zones and takes a little more than six days to ride from start to finish. My friend and I board in Ulaan Baatar, Mongolia. The regular, second-class, or ‘kupe’, cabins have narrow bench-beds, pillows filled with sand and prison-grey blankets. The air-conditioning doesn’t work, the window won’t open, there is no shower and the stainless-steel toilet seat wobbles so much that it takes some guesswork to predict when it will line up with the bowl. At first there is no dining car attached to the train and we have no food. Fortunately, our fellow passengers are seasoned Russian train travellers and offer sausage, pickled cucumbers and multiple shots of vodka. Further along the line a dining car is attached and we indulge in chicken consommé and fine crêpes dusted with sugar and cinnamon. My travelling companion takes a double dose of sleeping pills to “shorten the trip by half” and is soon unconscious. When the border guards come through the train with their sniffer dogs and ask if we have any drugs, it feels odd to look surprised and say we don’t, when no amount of shaking and screaming will wake her. After 26 hours of endless forests of firs, larch, spruce and silver birch, we finally arrive in Irkutsk. The sheer sensation of squeezing my tongue against my teeth to hiss out the last three consonants is evidence enough to know that we’ve arrived somewhere very unusual. The palatial station building seems to be the pride of the town, but immediately beyond it the scenery changes. The roads are pot-holed, the buildings are dilapidated and the paper-thin tin trams that rattle past us look like huge toys, except their occupants are not smiling. But there is no need for apology. Yes, a large part of Irkutsk is shabby, but further afield there are beautiful 18th-century churches, handsome merchant houses, intricately carved windows on log cabins and wide, grassy parks with fountains and flower beds. Founded 353 years ago, Irkutsk prospered as a gold rush town and as the junction in the ‘Tea Road’ between China and Europe. It stands on the banks of the wide Angara River, along which it is customary for newlyweds to clamp padlocks on the riverside railings. At a local restaurant we are served borscht, pickled cabbage, pelmeni (meat dumplings) and kvass (a fermented rye bread drink). The waitress is a student and speaks reasonable English. She is beautiful, with piercing eyes that seem to swallow you when you look into them. Russian girls are fashion-conscious and it’s always a treat to see what they wear on their feet: there seem to be more shoe shops here than anywhere else in the world. 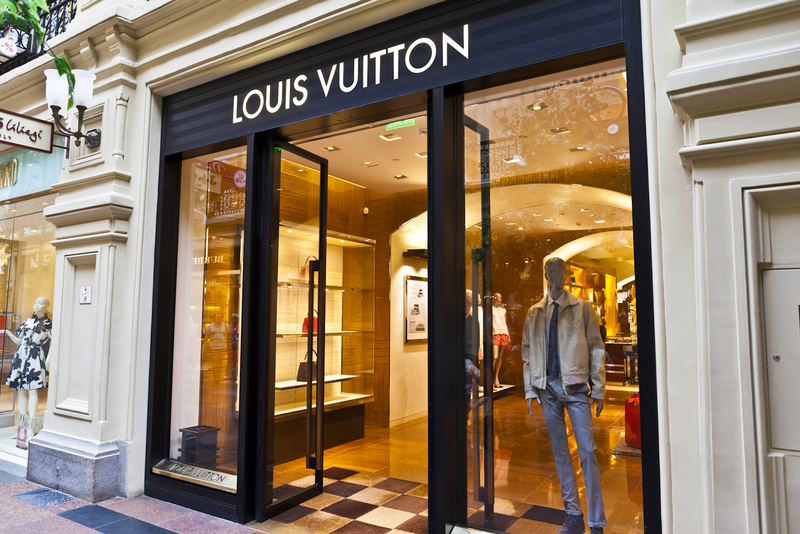 Several fashionable streets are lined with shops, from chain-store brands such as Mango and Adidas to high-end names like Cartier, Louis Vuitton and Max Mara. Asked if she knows about the infamous gulags that were located nearby, the waitress nods: her grandfather was imprisoned there, but that was long ago, she says. What counts now is having a job to pay the bills and afford all the wonderful things that are available here. Others say their ancestors moved to Siberia to escape poverty elsewhere in Russia. They were given land holdings and other concessions in exchange for working in this harsh frontier land. And as for the gulags, they have been dismantled, and thinking about them won’t help anyone anyway. It seems that Siberians have filed away the injustices of the past. 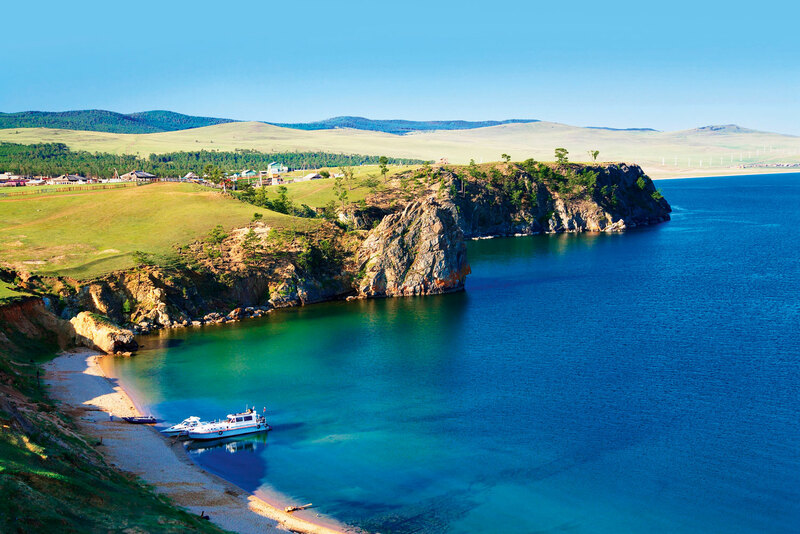 For vacations, locals head to Listvyanka or other nearby villages along the shores of the world’s largest and oldest freshwater lake, Lake Baikal. Here, the waters are so clear it’s possible to see 40 metres below the surface. In winter the ice is one metre thick, making it the world’s biggest skating rink. Even though summer temperatures are high, swimming in the pristine waters is impossible – it remains freezing cold and, apart from running in and out in short bursts, no one is seen splashing about. But there are plenty of sunbathers who spread their food and drink on the pebbly beach just below the main street footpath. The young girls are bronzed, slim and stunning in their scant bikinis. Their mothers and aunts are also there, also in bikinis, but they fill them out very differently. The lake, with its unique flora and fauna, is an ideal place for nature lovers: there is a story of a curious fish, the golomyanka, which is translucent and supposedly melts in the sunshine because of its high fat content, leaving behind an oily stain and porous bones. I don’t see any. 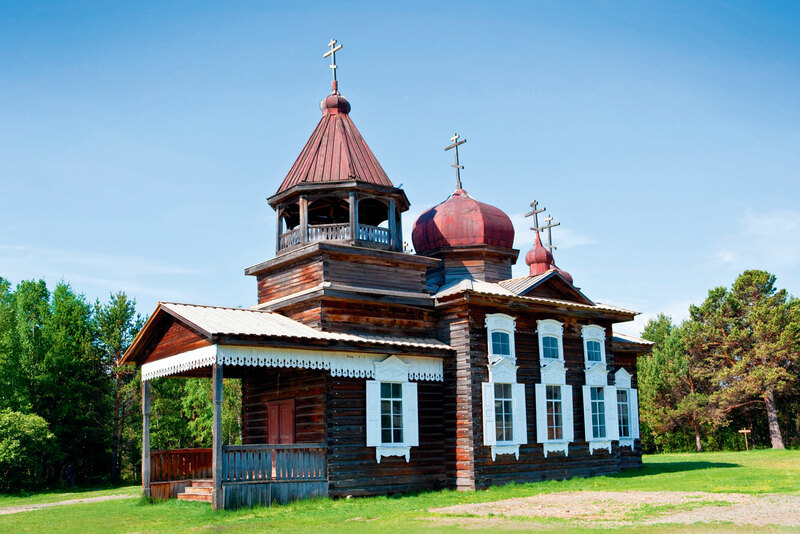 Though still a village of timber cottages with carved painted windows, Listvyanka is in the process of becoming something of a resort town and the few bars and restaurants are well attended by locals and tourists. After our moment in the sun, it is time to head west, across the vast expanse of taiga forest to Yekaterinburg, 50 hours and 3500 kilometres from Irkutsk. Scammers thrive at the railway station. An amiable porter offers his services, which we accept in exchange for a few roubles. Suddenly, five porters spring from nowhere to demand a sum equivalent to $40 because we have not one but two big bags. They produce a concealed ‘price list’ and insist on payment. We threaten to go to the Tourist Police and the scammers back off. 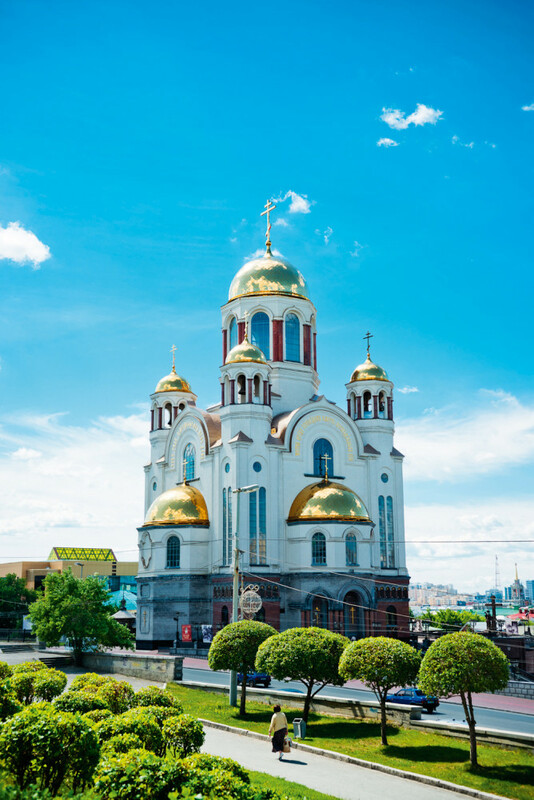 Yekaterinburg has the feel of a big city with its wide streets, up-market stores (including the usual preponderance of shoe shops), stately buildings, galleries, theatres and an elegant, riverside esplanade. In the middle of Lenin Prospekt, the main thoroughfare, stands a tall statue of Lenin with one arm raised, apparently commanding people to follow his anti-capitalist path. Right behind him is an Armani boutique. It was here in Yekaterinburg, in 1918, that the last Russian Tsar, Nicholas II, and his family were assassinated by the Bolsheviks. The murder took place in a house on the site of which now stands the golden-domed Church on Blood in Honor of All Saints Resplendent which commemorates the tragic event. After the deed, the executioners threw the bodies into a deep pit, the Ganina Yama, which was declared holy ground in 1981 to honour the royal family’s suffering. Now it’s a place of pilgrimage, featuring a monastery and seven chapels, one for each member of the family. Eventually, the Tsar’s remains were discovered, exhumed and given a state funeral in July 1998. Yekaterinburg has an unusual location, lying on the Europe-Asia border which stretches along the Ural Mountains. It’s amusing to move back and forth from Europe to Asia or stand literally with one foot in each continent – a stone plaque marks the border. From here the train leaves Siberia and enters European Russia, heading for Moscow some 26 hours away. It has been fascinating to experience this part of the world, for so many decades locked away behind the Iron Curtain. It is a place of extreme beauty with a history of savage violence, a place from which my great-grandfather never returned. His son, my grandfather, studied law and later worked as a solicitor in Poland. My parents left Poland with my brother and myself in 1958. We travelled over 13,000 kilometres to Australia because my father wanted to be as far away from the USSR as possible. There is a saying: Our parents left their homeland because of the bad, despite the good. We go back to search for the good, despite the bad. Air China flies daily from Sydney to Beijing, with connecting flights to Ulaan Baatar, from $2374 per person. With winter temperatures reaching -50 degrees Celsius, travelling during the summer months makes much more sense. Bring your own small version of the Cyrillic alphabet as it’s rare to see any signs written in the Latin alphabet. Delicately painted papier-mâché boxes, Matryoshka (Babushka) dolls, embroidered scarves, birch bark carved boxes.